Spike and Teddy Bear are the official mascots of Black Chateau Enterprises. 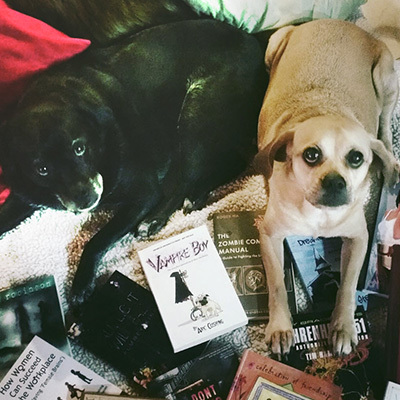 Voracious readers, Spike and Bear love books almost as much as doggy treats. They love wearing their hoodies and curling up by the office fireplace with the latest books being promoted by Black Chateau. Above all else, they like to take snaps with their books and post them to Facebook and Instagram—true story—and they have a large and loyal fan base on social media, to boot. Spike is partial to horror, mysteries and thrillers. She loves YA and NA, and can’t stop barking about inspirational stories and historical fiction. Teddy Bear likes sci-fi, fantasy and middle grade fiction. He is a big fan of the classics and rolls over for poetry and short stories.